One of the concepts that I try to teach my puppy families and consulting clients is that caring for your pet naturopathically does help them to truly thrive. Feeding a species appropriate raw diet, and avoiding exposure to pharmaceutical and environmental toxins allows then to develop a fully functioning immune system, so that when faced with adversity that healthy immune system can kick in and naturally balance what is out of homeostasis. This is what helps your pet live a long, healthy life. If an accident or illness does happen, we need to focus on bolstering the immune system first, to allow Nature to do the healing and then as needed assisting with natural products that encourage healing. I saw a fine example of these principles in action recently in a situation with one of my friend’s dog, Jersey. 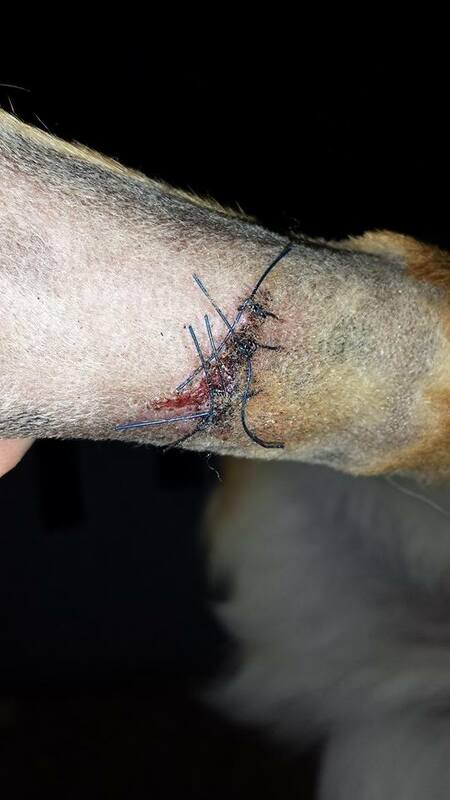 On May 18, Kelly posted that Jersey had cut her leg on some edging in the yard and was at the emergency vet and was going to have to be sedated to have stitches. 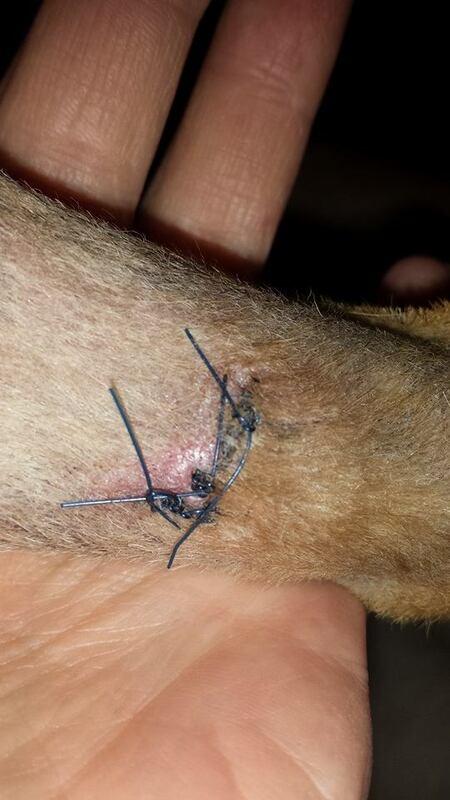 Jersey ended up having 8 stitches, as the wound was very deep and jagged. The emergency vet wanted to sell Kelly 2 different prescriptions for pain as well as a round of antibiotics(Augmentin). Kelly refused that and said she would go a more natural route and keep a close eye on the wound, just in case. She knew with all those drugs, on top of the anesthesia drugs, poor Jersey would have felt much worse than she did anyway! 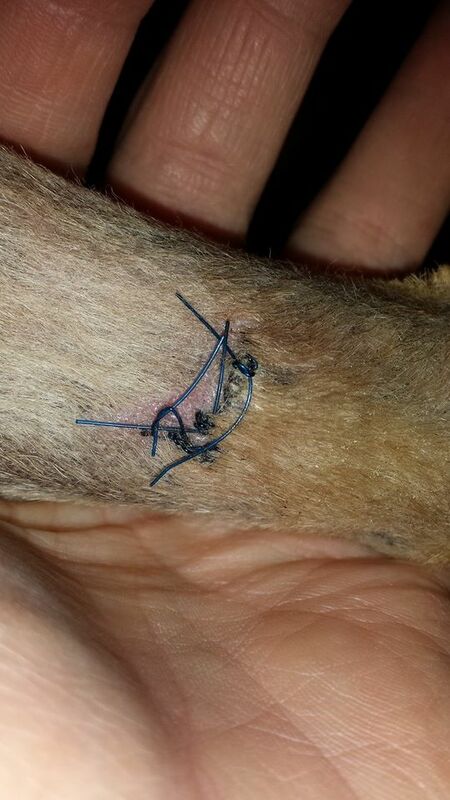 Of course the vet was not happy with that! His training told him that those drugs are the accepted protocol, and that’s what needs to be given in this case to manage pain and stave off infection, after all the wound was acquired outside in the dirt and could have been cause by any germy thing! 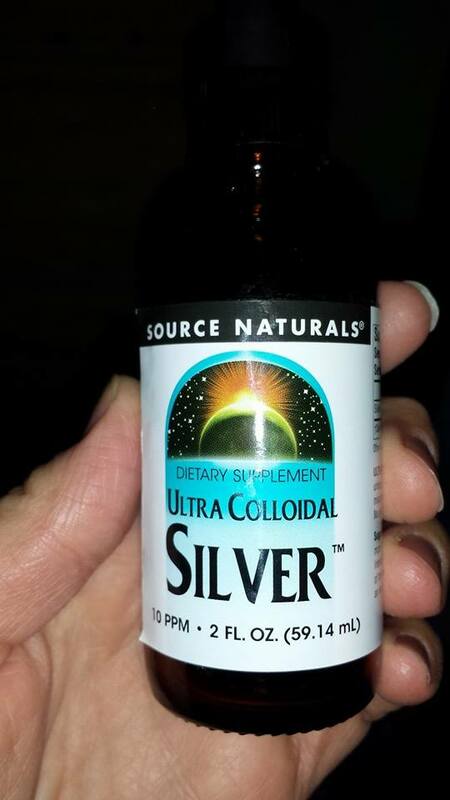 Kelly stayed calm and strong and said she would check back with her regular holistic vet the next day or so, which she did and the H-vet agreed to follow the more Natural protocol Kelly had devised, of Arnica 30c 2-3 pellets as needed for post-surgical pain and swelling, Colloidal silver 10 ppm and Goldenseal orally and 10 ppm Colloidal Silver topically with every daily bandage change. 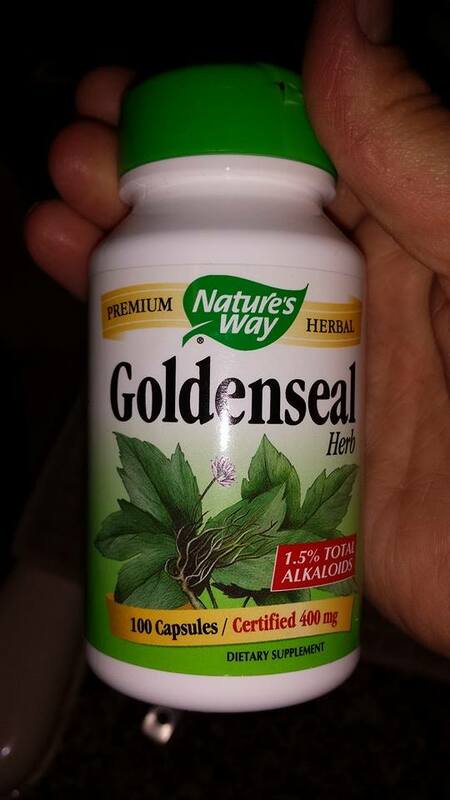 Goldenseal and Colloidal Silver have been used for years because of their natural antibiotic properties, the difference in them and modern pharmaceuticals is that they do not destroy all the bacteria, they just target the bad ones and keep them under control so the body can heal the wound, naturally. 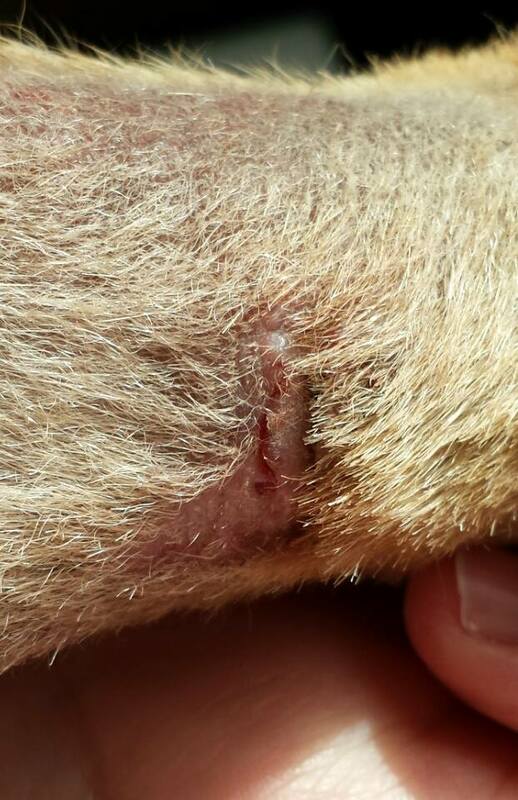 As you can see evidenced in these pictures of jersey’s wound as it healed, it healed quickly and easily with no hint of infection. 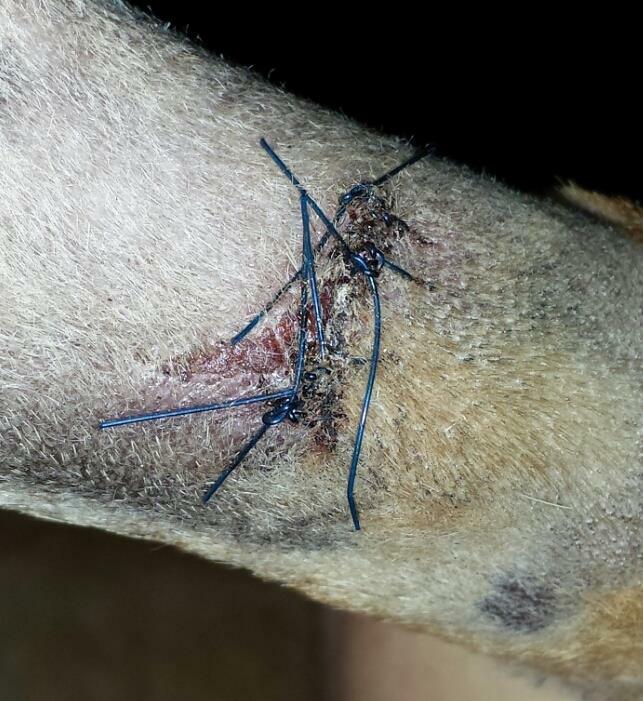 Jersey had more of an issue dealing with the medications used to anesthetize her than she did with pain from her wound. 10th day stitched 8th day treated. I try to get it from the same angle each time but I’m lucky to get anything. From straight on it almost looks worse than yesterday’s, but it’s not. 11th day stitched 9th day treatment. Looks about the same as yesterday. Tomorrow morning will be her last oral dose. 12th day stitched 10th day treated. 14th day stitched, 12th day treated. 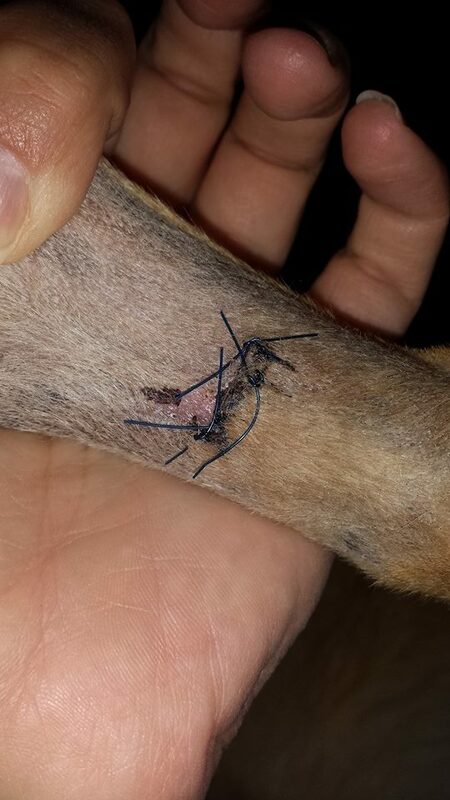 Tomorrow stitches are out! I want to point out as well that Jersey is already a Naturally Reared dog, she is fed a nutritious raw diet and Kelly avoids toxins like spot on flea meds and such. 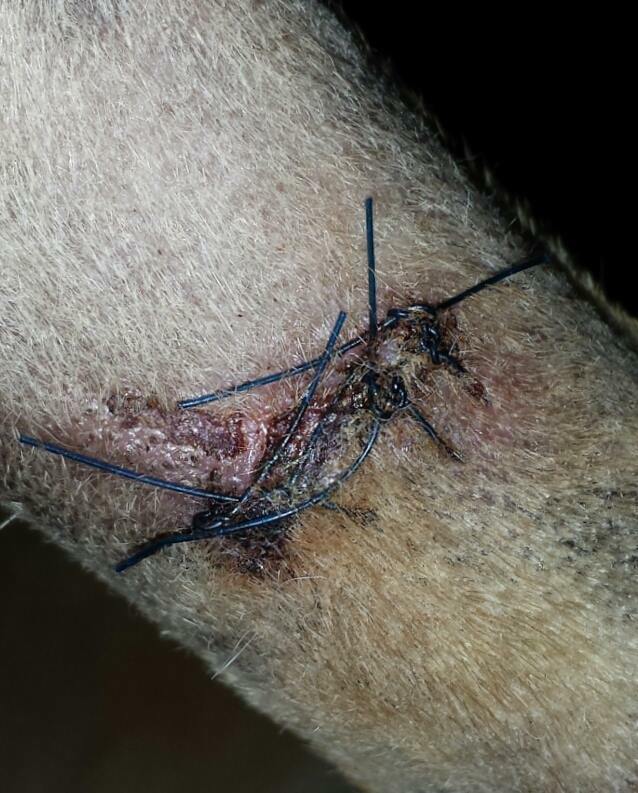 Jersey was already in tip-top shape, well able to deal with an issue like this wound affecting her homeostasis! This is the synergy I am speaking of. Diet, immune system, overall health, and natural, gentle treatments that assist healing all work together for the best possible outcome. What could be better? Less pain for Jersey, less treatments needed, less time missed from work, less money spent overall, and a pup that gets back to being a pup quicker. 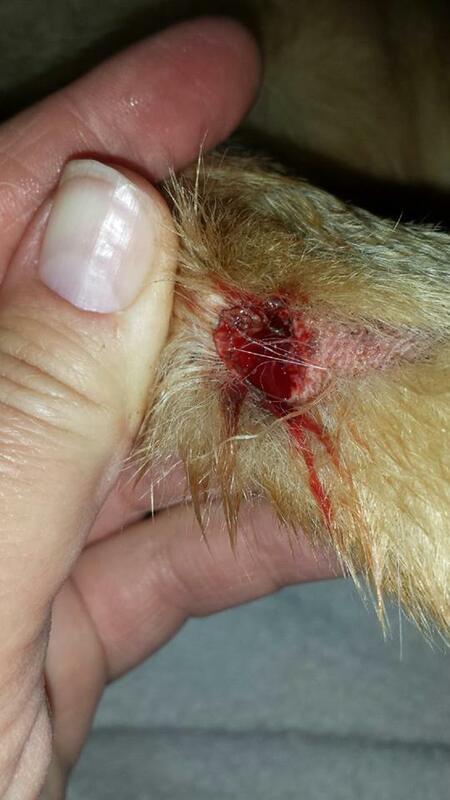 Conventionally reared dogs, that is dogs fed kibble, and exposed to toxins and pesticides monthly in the name of prevention and vaccinated “as recommended” start out with a strike or two already against them when something like this wound happens to them. Their immune system has to work even harder to get back to health. All the while, being suppressed by pharmaceuticals. We all have heard that scientists are finding out that a large portion of our health is contributed to our gut… so how can we(or our pets) stay healthy & heal ourselves when our precious, precariously balanced gut bacteria colonies are being killed off wholesale by antibiotics. A pet that is fed a dead, processed food has no way to regain those millions of bacteria it needs to digest and stay healthy and a vicious cycle is began of digestive problems, slow healing, and chronic illnesses, and eventually, fatal illness. 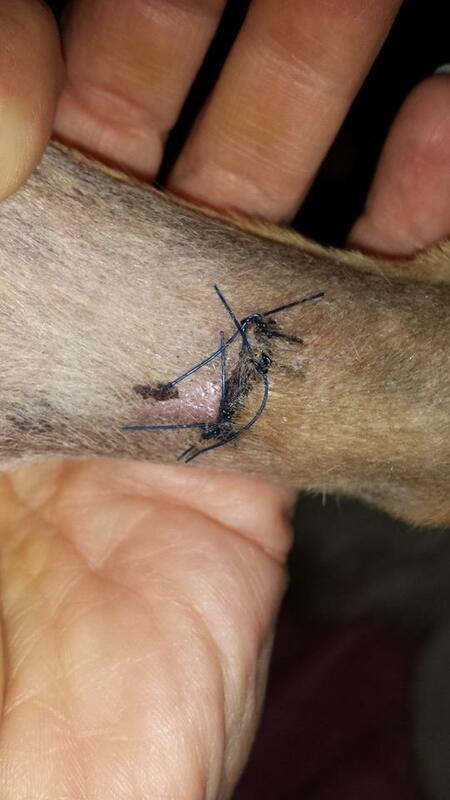 I have seen and heard of supposedly healthy, conventionally raised dogs, that got a similar wound to what Jersey had. 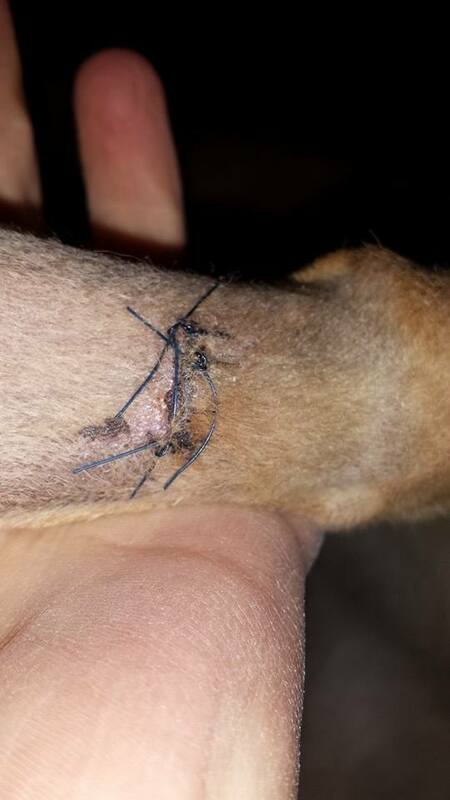 They immediately received vet care and a week or so later ended up with a massive infection, surgery, post-operative drains, and subsequent digestive problems. there are many factors involved, but my point is if we can raise our pets naturally, in a way that supports the immune system rather than tears it down, why would we not! There are many ways to learn if you don’t know anything about Natural rearing, search out a raw feeding group on Facebook or Yahoo, a practicing classical Homeopath or a Naturopathic professional to teach you these principles. 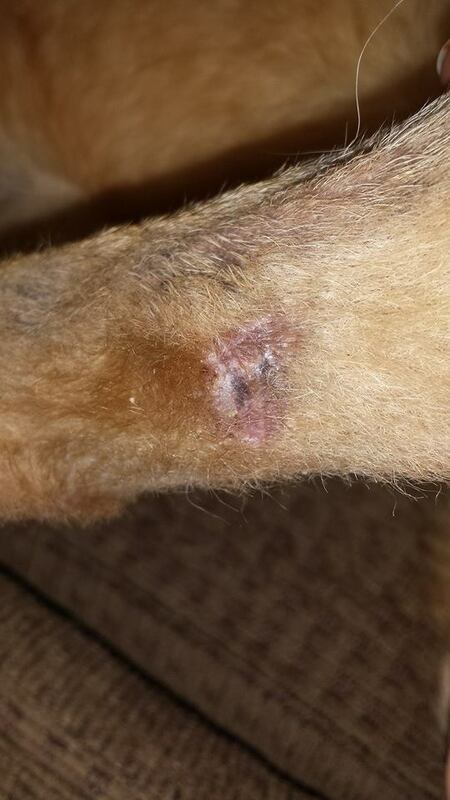 Kelly is now following up on Jersey’s wound care by applying organic coconut oil to the area to further promote softening and healing of the tissues to avoid as much scarring as possible.